Scientists have discovered a remarkably simple way to suppress a common instability that can halt fusion reactions and damage the walls of reactors built to create a "star in a jar." 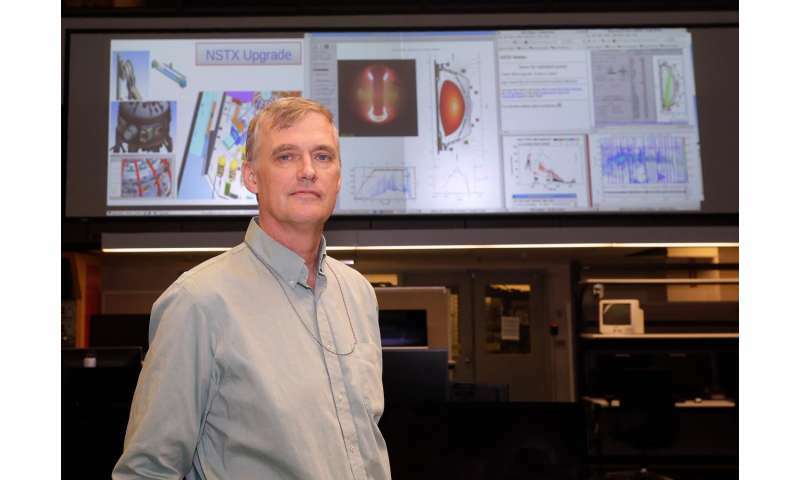 The findings, published in June in the journal Physical Review Letters, stem from experiments performed on the National Spherical Torus Experiment-Upgrade (NSTX-U), at the Department of Energy's Princeton Plasma Physics Laboratory (PPPL). The suppressed instability is called a global Alfvén eigenmode (GAE)—a common wave-like disturbance that can cause fusion reactions to fizzle out. Suppression was achieved with a second neutral beam injector recently installed as part of the NSTX-U upgrade. Just a small amount of highly energetic particles from this second injector was able to shut down the GAEs. Such instabilities are akin to a snake or dragon that swallows its own tail. Stirring up GAEs are the same neutral beam particles that heat the plasma, which are ionized into electrons and ions, or atomic nuclei, inside the gas. Once triggered by these fast ions, the GAEs can rise up and drive them out, cooling the plasma and halting fusion reactions. Suppressing this arousal were beams from the second injector, which flow through the plasma at a higher pitch-angle, in a direction roughly parallel to the magnetic field that confines the hot gas. Physicists call such beams "outboard" to distinguish them from the "inboard" beams that the original NSTX-U injector produces, which flow through the plasma and the magnetic field in a more perpendicular fashion. Injection of the outboard beam suppressed GAEs in milliseconds. Fast ions from the beam combined with those from the inboard beam to increase the density of the ions and alter their distribution in the plasma. The sudden alteration reduced the gradient, or slope, of the ion density, without which GAEs were unable to form and ripple through the plasma. These remarkable results were good news for fusion development. "Normally, when you inject energetic particles, you drive up instabilities," said Jonathan Menard, head of research on NSTX-U. "The fact that the second neutral beam was able to turn them off by varying the fast-ion distribution with a small amount of particles provides our research with flexibility and is a welcome discovery." The result validated predictions of a computer code called "HYM," developed by PPPL physicist Elena Belova, and could prove useful to ITER, the international fusion facility under construction in France to demonstrate the ability to confine a burning plasma and produce 10 times more energy than it consumes. "This research demonstrates suppression of GAEs with just a small population of energetic particles," said physicist Eric Fredrickson, lead author of the journal article. "It gives confidence that by using this code, reasonable predictions of GAE stability can be made for ITER." It's nice to see a scientist with an appropriate look on his face for a change. Oh, gee, look there, they ran a simulation-- something #sciencecranks deny works-- made a prediction based on it, then built equipment to test it, and it worked. What a surprise <-sarcasm. Such instabilities are akin to a snake or dragon that swallows its own tail. The Ouroboros is an archetype from antiquity found all over the world. Seems as if our ancestors were aware of plasma formations as shown by Anthony Peratt and his analysis of petroglyphs found globally. There is prodigious evidence these formations were witnessed in the pre-historic sky. heck your claims are proven false by a Phys.org only search! The electrical properties of plasma go all the way up, and all the way down. Electrodynamic plasma processes are scalable, all the way up and all the way down. The circuitry that explains the instability in the plasma chamber is analogous to the circuitry of the storm eating it's tail and then "fizzling out". Keep in mind, it is an analogy but it is likely the circuitry is similar bit on a larger scale. The irony of this whole class of articles is that the Sun is of course doing its job without these forcing tricks which are applied by laboratory fusion scientists. The Sun, of course, having sufficient gravity to pull IN instabilities. The difference, it seems, boils down to the existence of double layers. Perhaps, concentric layers is a better description. much the same purpose as all of these tricks in stabilizing the plasma are meant to force. Tricks are necessary inasmuch as we attempting to CONTAIN without massive gravity. The irony is only your own as you refuse to consider what CAUSES the "concentric" layering. Oroborus analogy is incorrect. It only represents a closed loop, when reality is an open loop. The difference, it seems, boils down to the existence of double layers. If these fusion theorists were to simply charge-load a sphere in a vacuum, they would immediately understand that the NATURAL way to solve these problems is to permit and facilitate the formation of double layers -- which do not really need to be forced. They just happen. Ouroborus analogy is incorrect. It only represents a closed loop, when reality is an open loop. Actually, the Buddhist have a thing more closely resembling reality. Enso (ring). It's an ALMOST closed ring. The entire difference between fusion reactors and stellar fusion is very simple, and @carbon_unit is right: stars have gravity, and fusion reactors do not. Fusion reactors have to use tricks with magnetics to form plasmas that support fusion; stars can use the relentless and simple compounded pressure of gravity. Our magnetic tricks must be subtle and powerful to duplicate this. It's really that simple. Not all simulations and predictions turn out to be correct. That's the point of the experiment.